Finally the wrath of the Beast from the East has abated. The trail laying day dawned hazy, but with no wind and no swell. By the time we launched at Seahouses, the sun had even come out. The day was to entail one dive, two groups (Nic, Darren and Peta; followed by Si and Michael). The first group had the job of cleaning the cannon, the second laying the trail. We shot the pile of three cannon then headed down. It seems that the easterly storms have taken a bit of a toll on Gun Rocks, with large areas denuded of Kelp, while some of the gullies have piles of dead kelp just floating in them. The trail area has fared better, with most of the mature kelps still remaining. On the cannons, only low growth was present, which was easy to remove. A few red seaweeds but mostly just juvenile furbelows kelp with its knobbly hold fast! For the second dive Michael and Si went down with the rope to install the trail. This took a further hour, with lots of knot tying and rope shortening with very cold hands. The water was only 8oC and Si was wearing only 3mm gloves so that he still had dexterity. Brr. But eventually they manged to route the rope under, around and over all of the cannon. The pile of three form the central point of the trail. Then there are three branches out from this. Subject to feedback this was considered to be the best configuration for joining all of the cannon together in a trail. The rope even goes over a pile of well encrusted cannon balls, so it will be interesting to see if anyone notices them! 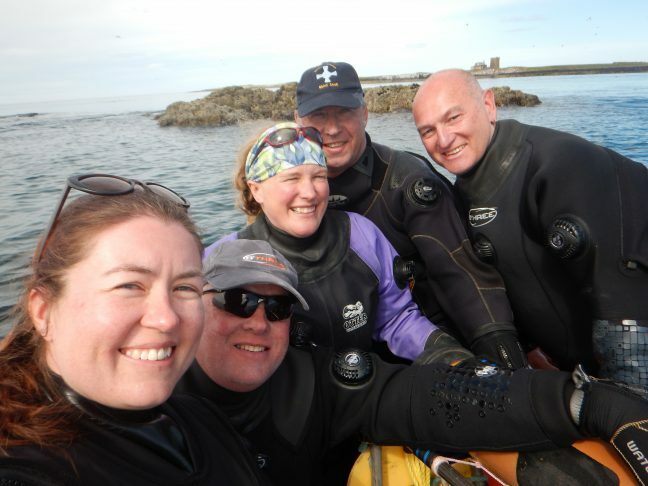 After a long dive each, we decided to return to Seahouses, happy I the knowledge that we have finally installed the Gun Rocks dive trail, ready for divers to try on Monday. ← When will the easterly winds stop?